What is the importance of meetings, like the AFM Biomed Conference, to you and the AFM research community? The AFM BioMed Conference is a great conference because it is very focused and brings together biomedical, biophysical, and biological applications of AFM. 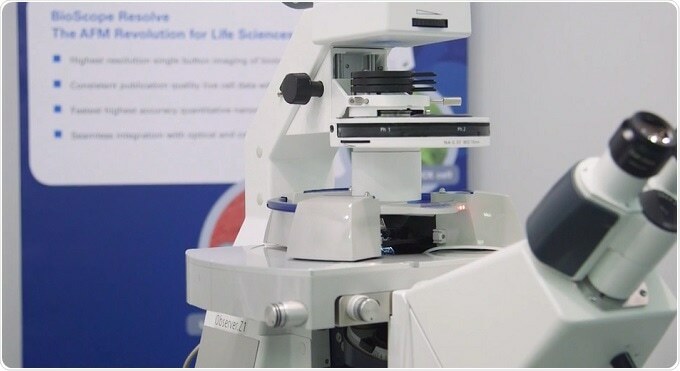 For us, at Bruker, it is a very interesting opportunity to interact with the community, to show them our latest technology and see where leaders in the field see it going. We’ve been sponsoring AFM BioMed for 10 years now and it is a conference where we're very actively involved in showing our latest technology. We even launched one of most important BioAFMs at an AFM BioMed Conference – the BioScope Resolve. This year, in Krakow, we launched a new version of BioScope Resolve, one which lets you do new things and for the first time, it lets you get statistical data on live cell samples. So, it is no coincidence we are launching it here to this community as this is really the best place to do that. What are the main life science applications of AFM? We see quite a range of applications of BioAFM from molecular to cellular to tissues. In fact, when we developed the BioScope Resolve, we had that in mind. We made sure that it has an excellent high resolution imaging tool with PeakForce Tapping and worked closely with the community in developing and fine tuning. So BioScope Resolve excels at molecular imaging, one of the important applications. Say, as a benchmark example resolving the double helix structure of DNA and the major and minor groove. Resolving it so well, that you can see local variations at the single molecule level, for example as a protein binds. 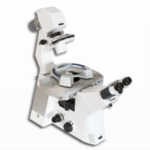 BioAFM is also a great cell imaging tool. In fact, it was also working with people at this conference here, such as Hermann Schillers for instance, that we found out that with our improvements in PeakForce Tapping, we are able to resolve individual microvilli on live cells. No other AFM can do that. AFM is also a really great tool for mechanobiology, for examining, and quantifying forces on and between cells. So, there's also a lot of technology for that in the BioScope Resolve aside from PeakForce Tapping. This includes FastForce Volume, giving us the broadest range of ramp rates for force mapping and time dependent studies. And ramp scripting, addressing cell viscoelasticity. It’s not just modes and software features. We optimized the entire mechanical loop, which enabled both, highest resolution imaging and more consistent force measurements. Regarding consistency in AFM force measurements, the AFM BioMed community is very active in asking itself the question how do you quantify, how do you calibrate those kind of measurements, and came up with protocols for that, what they called initially the Dubrovnik method. In BioScope Resolve, we actually implemented a workflow and we launched probes that let you follow that exact workflow. Conforming to that best-known method for quantifying forces, force measurements with cells together with its core performance will allow Resolve to advance Mechanobiology. How has the market responded to the BioScope Resolve since its introduction? BioScope Resolve gained very fast traction in the market, immediately after its introduction at the AFM BioMed conference in San Diego. We saw early customers immediately embracing the new capabilities, for example work by the Mueller and Alsteens groups in high resolution recognition mapping and quantifying virus binding kinetics, combined with optical integration. Can scanning be made faster to improve imaging even further? Yes, in fact with Resolve we showed new levels of imaging speed while imaging whole cells, and even faster speed on molecular samples - while retaining force control, keeping fragile molecules intact. Faster imaging is of interest for a number of reasons. One there is the ability to do more. Not just plain productivity, but also obtaining statistically valid data sets. This is a direction we are enabling with Resolve with faster imaging as well as the high accuracy stage where we automatically execute measurements on dozens of cells, within the whole motorized stage range, and with no loss in performance. And then there is the interest in dynamics, at the whole cell level, as well as dynamics of large biomolecules. In both cases the combination of AFM and probe technology have allowed advances seen in BioScope Resolve. Bioscience applications of AFM have been at the forefront on AFM technology since its inception some twenty years ago. How do you think the technology has changed since the early adopters started using this technique and where do you see the next logical development step for BioAFM technology? Clearly, the last twenty years have witnessed a great expansion of BioAFM, especially where AFM data is correlated with a range of optical microscopies. We have seen a wealth of high-speed dynamics work, high-resolution molecular imaging, live cell imaging, and cell mechanobiology. Clearly one trend that we see continuing into the future is probing of single cells, beyond topography imaging to single cell manipulation, injection, recognition and force mapping, and mechanobiology. This is where PeakForce QNM plays a key role and we see it combined also with super-resolution, and this is where AFM can play out its unique advantage as high resolution physical probe employing quantifiable forces, and advancing the growing field of mechanobiology. 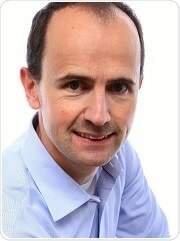 Dr. Thomas Mueller is the Director of Product Management in the AFM business unit of Bruker’s Nano Surfaces Division. Thomas has been with Bruker for 12 years having held positions in applications and product management, and is the author of over 50 publications, reviews, and application notes. He received his Ph.D. in 2000 from Yale University on developing new linear and nonlinear spectroscopic probes of molecular structure and dynamics, followed by postdoctoral research at Columbia University focusing on scanning probe microscopy as a tool for interrogating self-assembly and chemical reaction specificity.